Don Quixote Is Alive And Well In… What? McHenry Illinois? 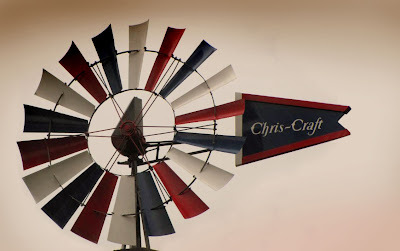 To heck with La Mancha, windmills are popping up in McHenry, Il.. Thanks to fellow Woody Boater Jim Staib of Fine wood boats. You can now fight windmills with your boat hook and varnish cans. Jim has been working on this for 11 years… For some reason I think it was in parts under stacks of wood for 11 years .. We all have those projects. The cool thing is that it’s done. It is for the record for all you windmill geeks that found this… A Aermoter 702 of unknown vintage on a 72’tower. You can see more shots of it on the Chris Craft Boat buzz Forum here. Introduce your kids to Classic Boating. What Jim didn't tell you is that it powers a coffee grinder at the base of the tower. Jim makes the best cup of coffeee this side of the Fox River. Jim tokd Boat Buzz folks when asked what it does "…goes around in circles all day and does nothing, sort of like me". A coffee grinder in cool months and a giant ice cream maker for hot summer days would put it to good use. Can you work on that, Jim? The model 702 was introduced in 1933 so a pre-war bergee is appropriate. Aeromotor has been around since 1888. If anyone could figure out how to power a coffee grinder using a vintage Aeromotor windmill, it's Jim. After all, he's a Harley guy….